North Lake Tahoe is approximately a 35-minute drive from Reno, NV and is North America's largest and most beautiful alpine lake. It's 22 miles long and 12 miles wide with 72 miles of scenic shoreline. With its deepest point at 1,645 feet and an average depth of 989 feet, Lake Tahoe never freezes over making it a year-round fishery. Our Lake Tahoe fishing charters specialize in light tackle angling for Mackinaw (Lake Trout), Rainbow Trout, and Brown Trout. The time of year and seasons are key factors in the size and types of fish our clients can expect to catch while fishing Lake Tahoe. As the Lake's water begins to warm up from it's Winter lows, larger Mackinaw (8 - 20 lbs +), Brown and Rainbow Trout (2 - 8 lbs +) become active and move up into the shallows to feed. This is the time of year we fish Lake Tahoe for trophy Mackinaw, Browns and Rainbows by top-lining lures and live bait with light tackle. 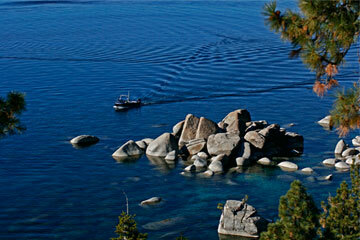 As one of the only licensed NV guide operations on Lake Tahoe we have access to virtually every mile of prime, unobstructed NV State Park shoreline (no docks, moorings, etc) – in addition to the usual productive spots. Fishing Lake Tahoe for school sized (2 - 7 lbs +) Mackinaw can also be very productive this time of year using deeper water fishing techniques. During the summer we focus our Lake Tahoe fishing charters on both school sized & larger Mackinaw in deeper water applying any one of a variety of methods such as trolling, jigging, or drifting, or using both live bait and lures. As the Lake's surface temperature warms up, Mackinaw and Trout retreat for deeper water, but there's still a decent chance for catching some trout, mainly Rainbows with one of our experienced Lake Tahoe fishing guides. As the water cools from its Summer highs, Rainbows begin to move into the shallows to feed. This is when we spend most of our efforts fishing Lake Tahoe for Rainbows with light tackle spinning outfits. A good day on the water (just a few hours), can yield over 15 Rainbows with an opportunity for a nicer Brown or Mackinaw. There are also plenty of Mackinaw to be caught using a variety deep water fishing techniques aboard our Lake Tahoe fishing charters. As Lake Tahoe's surface temperature drops to its coldest levels of the year, we focus our Tahoe sport fishing efforts on catching school size Mackinaw in deeper water, weather permitting.